Last night, America met the 2016 election season’s newest star. Portly, crimson-clad, bespectacled, mustachioed, and just a little bit giddy, Kenneth Bone was catnip for the bored, half-drunk, miserable masses watching the debate. The internet couldn’t shut up about him, and the press followed suit. “The Ballad of Ken Bone,” the Atlantic mewled; “And the winner of the presidential debate is... Ken Bone,” CNN declared; “Ken Bone Is the Only Honest Man in This Election,” Esquire announced. The candidates, of course, were delighted. “I think it’s such a great question,” cooed Donald Trump, who denied ever denying climate change during the last debate. He then went on to bloviate about “clean coal,” which, besides not actually existing, also allowed him to neatly side-step any tough statements about climate change, climate science, or any of the specific issues currently plaguing our planet that will almost certainly cause our downfall in about 100-odd years. Hillary Clinton went on about turning America into a “21st century clean energy superpower,” though she did acknowledge—extremely briefly—that climate change is a “serious problem.” You don’t say. That climate change—and science in general—didn’t come up in any real way during the debate shouldn’t come as a surprise, because we are the country, after all, that continues to deny the problem exists in the first place. But that’s exactly why Ken Bone missed his opportunity so monumentally. You had the chance in the palm of your hands, Ken. You could have trapped them. You could have tricked Trump into saying the other astoundingly dumb things about science we all know he’s capable of. 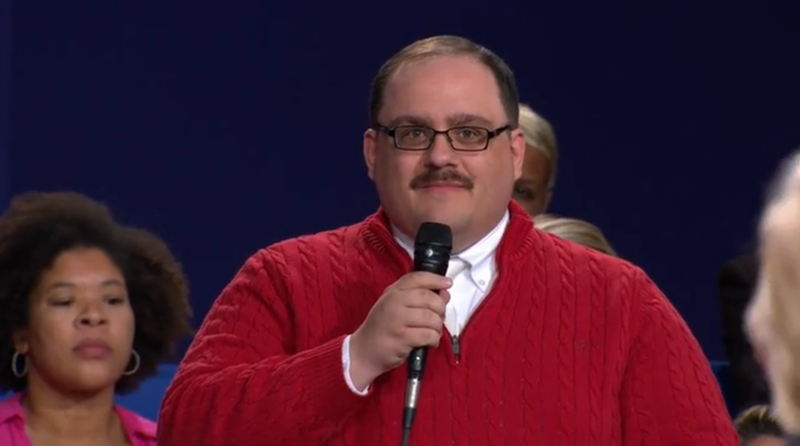 Instead, all we got was that lousy question, and the emergence of the Ken Bone Love Train. Sorry, Ken. You’re probably a great guy. Everyone calling you a hero isn’t wrong to want some kind of shining light amidst the supermassive black hole that was last night’s debate. But that doesn’t mean you didn’t screw up a precious opportunity to add some substance to the discourse.